Two days is enough time to visit the sights that this historic city is so famous for. A trip here would not be complete without seeing the Bayeux Tapestry. The 58-scene tapestry is proudly displayed in Musée de la Tapisserie de Bayeux and is undoubtedly the most famous piece of needlework in the world. It is remarkably well-preserved and there is a fifteen minute film explaining its history. On your second day, be sure to visit the Bayeux Cathedral, an impressive Gothic cathedral which dates back to the 13th century and is situated in the heart of the town. With a whole week you can discover Bayeux at a leisurely pace. After seeing the city’s two main sights it is worth trying out some of the restaurants in this picturesque place. Eat by the river for excellent views and delicious food made with fresh Norman produce. 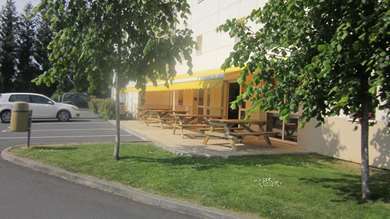 The Premiere Classe Hotel Bayeux is easy to reach from the motorway and is well located for Bayeux’s attractions. The BayeuxWar Cemetery is the biggest Commonwealth military cemetery in Normandy. There are 4848 soldiers’ graves here. Even children who do not understand the history of Normandy will appreciate the beauty of Gold Beach. If the gold sand, blue skies and turquoise sea don't entice you, the water sports will. Bayeux is easily accessible from several places, including Paris Amiens and Caen, from the N13 motorway. The nearest airport is Caen-Carpiquet Airport, which is 20km away, and the nearest ferry stops at the Port of Ouistreham, 30km from Bayeux. Rail links are to the city are good and you can reach Bayeux from Paris in around two hours. There is a local bus service around the town and regular trips to the D-Day attractions. Taxis are also available within the city itself. There are plenty of places to eat in Bayeux to suit all tastes and budgets. If you want authentic cuisine made using fresh Norman produce, eat at Le Pommier. Try the roast duck with heirloom vegetables. La Reine Mathilde is an old fashioned bakery and tea shop serving delightful pastries and cakes - a great place to relax after a day of exploring. Every year on 5th June at 3.30pm, the Royal British Legion attend the 3rd Division Caen Memorial service and Beating Retreat ceremony and, on the 6th June, they hold a remembrance service in Bayeux Cathedral, which begins at 10.15am. Following the service, the Royal British Legion hold a remembrance service at the Bayeux Cemetery. The services are all open to the public and parades are open to serving and ex-servicemen and women. The Bayeux War Cemetery is the biggest Commonwealth cemetery, of WW2 in France. It contains 4648 graves, including 3935 British and, surprisingly, 466 Germans. Most buried here were killed in the Normandy invasion.